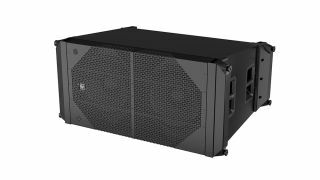 The What: Electro-Voice has expanded its X-Line Advance line-array loudspeaker family, launching the X12-125F flying subwoofer, a dual 15-inch system equipped with high-output EV-engineered transducers delivering 9,600W output. The What Else: The X-Line Advance family currently consists of two-way vertical line-array loudspeaker elements providing 90- or 120-degree horizontal coverage, the dual 18-inch X12-128 ground-stacking subwoofer, the TG7 system power and processing rack, and a complete package of rigging and transport materials. The new X12-125F subwoofer complements existing X-Line Advance models in a wide range of possible system configurations. Configurations include flown three-way system with X1 or X2 mains and X12-125F as subwoofer; flown four-way system with X1 or X2 mains, with X12-125F flown next to mains in LF mode and X12-128 as ground-stacked subwoofer; flown three-way system with X1 or X2 mains and X12-125F above mains as subwoofer in single flown array; and flown four-way system with X1 or X2 mains and X12-125F above mains in LF mode in single flown array with X12-128 ground stacked as subwoofer. Ground stacked configurations include three-way configuration with X12-125F as the base of the ground stack in subwoofer mode, with X1 or X2 above as mains; and four-way configuration with X12-125F as the base of the ground stack in LF mode, with X1 or X2 above as mains and X12-128 as center mono subwoofer array. The X-Line Advance line-array loudspeaker system from Electro-Voice delivers a combination of SPL, bandwidth, coverage, and scalability to address the widest range of professional live sound applications. Designed in close collaboration with audio professionals from across the touring and installed sound industries, its innovative, efficient two-way design (X1 and X2 models) provides a level of performance normally associated with much larger and heavier three-way systems (therefore reducing power requirements to achieve similar results), while its compact, lightweight form and integrated rigging system are designed to save time, money, and manpower in transit and setup. The Bottom Line: The X12-125F features the same rigging system found in the rest of the family of products for quick, secure and seamless deployment in arrays, and is sonically matched to the other members of the family: X1 and X2 (high-performance) full-range models, and the X12-128 ground-stacking dual 18-inch subwoofer. The X12-125F can also be used in ground-stacked configurations, making it well suited for rental companies and mobile applications, as well as fixed installations including live performance venues and houses of worship. Its compact, lightweight 18-ply Baltic birch enclosure is finished in EVcoat for superior durability. The X12-125F is available in the Americas in April, 2017; in EMEA in May, 2017; and in Asia in June, 2017.